Getting out into the January landscape…Cooper River on Sunday. Immediate impressions are of light and dark; valleys filled with fog, mountains looming but hidden. The snow is wet and heavy. The air is so wet and heavy that it solidifies in droplets. The forest is so different from the back of a snowmobile than it is on foot. The noise, smell, and movement of the machine strip the woods of subtlety–I am only aware of what grabs my attention as I zip by. When we stop, suddenly it’s quiet and still. I see that colors are minimal. There is green, but its a deep green of hemlock boughs contrasting with white snow. There is blue, but it’s a faint glacier blue down in the snowpack, indicating the presence of trapped water. No reds, no yellows except for snowmobiles and riders. It’s a cool color scheme when people aren’t there. There’s a shushing sound as snow falls. The trees are weighted down by the whiteness. I know the mountains are there, the big rocks we call Lemah and Three Queens and Chikamin. I know them by their silence, even though I can’t see them. The bottom of the cloud ceiling parts for a moment and I get a glimpse of lower Mineral Creek. Then it’s gone again. This is raven country, this dark and white world. Not the town ravens who jostle around the snow berms and dumpsters in Cle Elum. No. The mountain ravens have much less to squawk about as they patrol the air around the ridges. They are present and watchful and even playful. It’s their job to know what’s going on, and when to drop a solitary “Kraaawk” into the echoing mist. “I know them by their silence even though I can’t see them” Beautiful line! 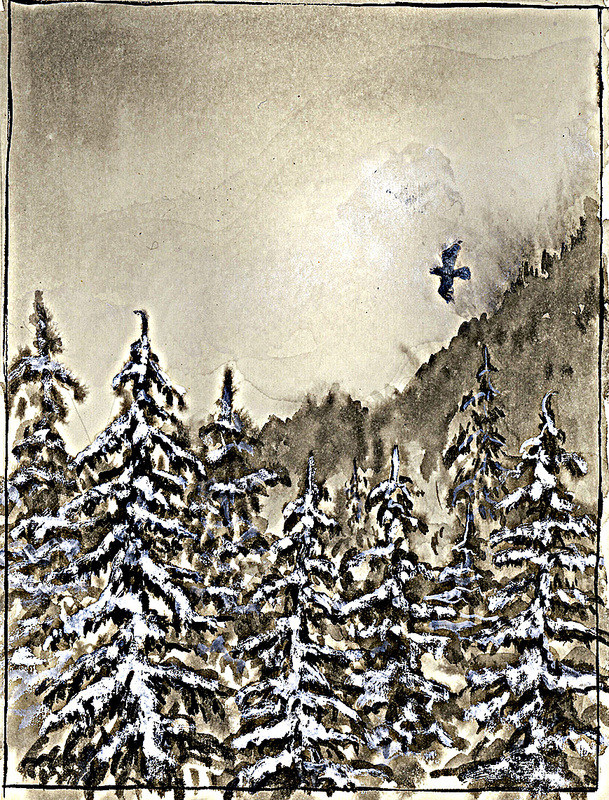 I so love the wild mountain ravens… the wild crows, too… we have many & I watch them labor up the thermals, to soar down, around, down, around, down… with only the occasional quick lift of a wing tip to show they COULD get upended… reminds me of children laboring up a snowy hill for the joyful slide down.